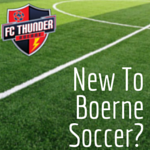 Financial assistance is available for players who have been offered, and accepted, a spot on a FC Thunder ACADEMY or SELECT Team. Funds for assistance are limited and the amount of an individual award will be determined by the number of qualified applicants requesting assistance and the total amount of funds available. Assistance is only awarded to reduce an amount of the registration fee and may not be applied toward costs of uniforms or any other team-specific additional expenses. Applications are due by 5/18/18 for U11 & U12 players and by 6/1/18 for for U13+ players.